Hall County has established a 24-hour warning point and emergency operations center. The County has more than one way to receive severe weather warnings and forecasts and to alert the public. There is a system in place to monitor weather conditions locally. Hall County officials consistently promote the importance of public readiness through community seminars. Hall County has developed a formal hazardous weather plan, which includes training severe weather spotters and holding emergency exercises. As a reminder, citizens are encouraged to sign up for the Hall County Citizen’s Alert System, which alerts residents through a variety of contact mechanisms, including cell phone, landline, email, text messaging, pager, and more in the case of severe weather or other emergency. Citizens can sign up to receive the mass notifications by going to alerts.hallcounty.org and clicking on the Citizen’s Alert System link. That’s where they can select what type of weather events they want to be notified of and through what method of communication they’d like to receive those alerts. “After signing up for what type of weather notifications they would like to receive, citizens can then select ‘other’ alerts to receive information about other important activities such as road closures, water utility maintenance and law enforcement notifications,” said Kimbrell. 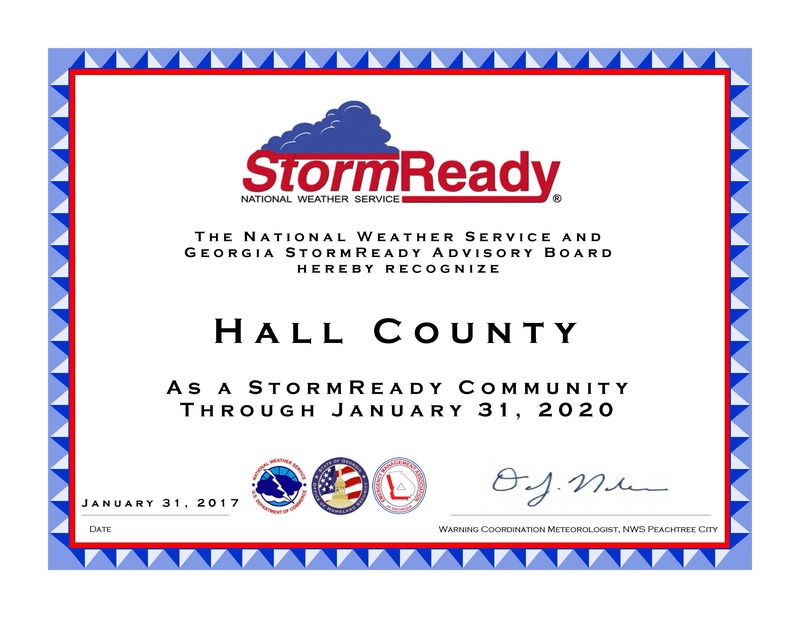 The “StormReady” designation is valid for three years and will expire on Jan. 31, 2020.